Part two of three in a series. This is a link to part one. Magic Leap’s vision of how devices will work and interact with the world around them is far beyond the capabilities of the company’s current developer version, the Magic Leap One Creator Edition. It’s beyond even what most forward-looking reviewers could imagine. To understand Magic Leap, you have to look past the device to the coming convergence of technologies that will make wearable invisible computing commonplace. The device is the least important part. It’s an AR enabler. Abovitz prefers the term “spatial computing” to “augmented” or “mixed” reality, because AR is associated with smartphones, and MR has been appropriated by Microsoft, obfuscating its original meaning. The company says the Magic Leap headset is a “location-based” device, because it is constantly scanning the world around it, partly to map it, but also to detect an invisible, digital “layer,” sometimes called “the spatial web,” or “AR Cloud,” and “register” (or “anchor,” in the parlance of mobile AR) the content of the layer onto the real world. The vision consists of three distinct elements: ubiquitous 5G networks, layers, or geolocated cloud content, and more advanced AI-enabled devices, which would access the layers when needed. The company calls this promised land “The Magicverse,” which is part tech and part Abovitz’s meticulous yet fantastical vision of the future. Much has been said about Magic Leap’s years of secrecy, always catnip to the press, especially after securing half a billion dollars of investment from Google and attracting elite tech, financial and entertainment investors. In a 2014 profile, The South Florida Business Journal quoted Abovitz as saying “In our industry, there are so many competing companies and games, and they have people constantly out spying on the competition.” Abovitz says that entire story is bull. Not what he said, and not what he meant. “We wanted to create the kind of anticipation that special event movies like Star Wars or Game of Thrones have, where people wait in line overnight to be the first to see it. I thought that would be really cool,” he said. Unfortunately, this was taken another way by the press, which even now doesn’t seem to fully comprehend Abovitz and Magic Leap. I’m not going to lie. I’ve talked to him and John Gaeta for hours. What they are doing and thinking is not as obvious to the rest of us as they think. For the next four and a half years, only an eclectic group of people were offered the opportunity to taste spatial computing using a bulky machine that Leapers call “The Beast,” at Magic Leap HQ in Plantation, Florida. Guests included celebrities, filmmakers, pop stars, athletes, investors, potential investors, politicians, and strategic partners like AT&T. To this day, an invitation to Plantation confers great status on the recipient. Abovitz is surprised to hear me say this. I am not surprised he is surprised. I have always been sympathetic to Magic Leap. Building a new operating system, a new optical system, and a custom chipset in four years is unbelievable. Hardware is hard, complicated, and mad expensive. Pulling that off for even $2.3 B seems remarkable, given the time and money Microsoft, Apple, Facebook, and Google have spent solving similar problems. I said so in several columns in Forbes. That, probably more than anything, is why I was sitting with Abovitz and Gaeta in Plantation, FL, in November of 2018, interviewing them for this book. Companies like Apple and Microsoft are also good at keeping secrets. Apple’s secret plans for its AR glasses are the subject of relentless rumors. Apple and Microsoft are massive organizations with tens of thousands of employees in locations distributed around the world. Projects are broken into pieces and one group often doesn’t know another. Projects can be more easily hidden this way, even from the people working on them. However, these giants are not simultaneously raising $2.3 billion dollars, which requires the company to put on a show. The press, which had been kept at arm’s length, was quick to pounce when it was revealed a Magic Leap promotional video was made by Weta. At the same time, Microsoft was releasing cinematic science fiction shorts about future use cases for the HoloLens, featuring an intelligent digital assistant embodied as a flying eyeball and latency-free 3D telepresence with remote participants on different continents. No one cared much about that. When Magic Leap showed a special effects-laden concept video made by Weta they were buried in a tidal wave of snark and derision that took the company by surprise. The tech press has not been kind to Magic Leap. “Who else would do this? No one would do this,” Abovitz said of Magic Leap’s first three years, which he funded mostly with his own money. “More than I probably should have,” he said. A $20 million Series A round, led by Hassan and several other angels, took the onus off him personally. Even before the first prototype was fully functional, Abovitz was preparing to raise venture capital, just as he had done with Mako. On the strength of his vision and the success of his robotics company, Abovitz has been wildly successful at fundraising, assembling a world-class roster of investors and strategic partners rarely aligned behind the same startup. Hassan introduced Magic Leap to Google. In May 2014, Abovitz got a call from Alan Eustace, one of Google’s most senior engineers, asking for his GPS coordinates. Eustace was in Florida testing a homemade space suit he would later wear to jump out of a weather balloon 135,000 feet above Earth, breaking the record for the highest free fall in history. He wanted to stop by. Soon thereafter, Eustace jumped out of a plane and landed near Magic Leap’s headquarters. He must have been as impressed as he was impressive, because, in October 2014, Google invested $542 M in the company. “I still wake up in the night going, ‘Holy crap!’?” Abovitz told The South Florida Business Journal. By the end of 2018, Magic Leap had raised $2.3 billion dollars at a $6 billion valuation from the biggest technology companies (Google and Qualcomm), media companies (Warner Bros., Disney), venture capital (Andreessen Horowitz and Kleiner Perkins), finance (JP Morgan and Fidelity), advanced telecom (AT&T), and e-commerce (Alibaba) companies. According to Crunchbase, of the nearly $6.3 billion raised by all Augmented Reality startups in the past ten years, 37% was for Magic Leap. Though $2.3 billion is an astonishing amount of money, Google and Facebook both raised billions more before going public. Uber, which like Magic Leap is a private company, has raised more than $24 billion. In May 2016, Abovitz appeared on the cover of Wired Magazine, with an accompanying feature. The story was sparse on detail but full of Abovitz’s soaring poetry about spatial computing. “Ours is a journey of inner space. 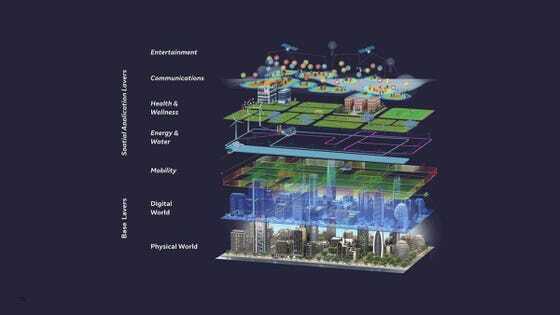 We are building the internet of presence and experience,” he said cryptically. Magic Leap gave its first preview of a working lightweight prototype to Brian Crecente of Rolling Stone Magazine in December 2017. He remarked the headset had a “steampunk aesthetic,” and the description stuck. It was comfortable, light and can accommodate prescription lens inserts. Crecente described the experience favorably. The field of view seemed bigger than the HoloLens. The Magic Leap One has a pocket size “Lightpack,” while the HoloLens is self-contained. The HoloLens leaves lots of room for the physical world. Magic Leap occludes it. Abovitz called the Magic Leap One “an artisanal computer,” a poetic way to describe a developer version of a computer for which there is little content. Right before its launch of Magic Leap One in August 2018, Magic Leap announced a strategic alliance and a new investor, AT&T, which also owns Warner Bros and HBO. Magic Leap’s spatial computing devices will be optimized to show off the telecom’s new latency-free 5G networks. Magic Leap announced plans to demo the device at select AT&T stores in Chicago, Atlanta, Boston, Los Angeles, and San Francisco in 2019. But in the fall of 2018, AT&T ran a “Crimes of Grindelwald” movie promotion that used the Magic Leap One in Chicago. Other locations may feature the Fantastic Beasts movie tie-in. AT&T had a similar exclusive deal with Apple from 2007-2009. At CES, in January 2019, AT&T and Magic Leap announced they were expanding their partnership to target the enterprise market together. As Convergence prepped for print in January 2019, Abovitz and I traded messages on Twitter. “You’ve only got 20% of the story,” he said. To really tell the Magic Leap story with the depth and nuance he would like, I’d need to write a whole book. End of part two of three. Part three will be published tomorrow. Together, the three parts are a chapter in my upcoming book, Convergence, How The World Will Be Painted with Data, which will be released March 12, 2019.